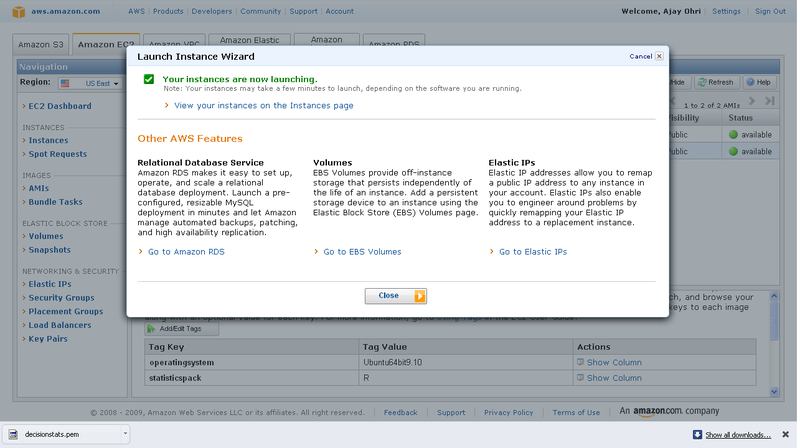 On my second day of bludering about high technology, I came across http://rgrossman.com/2009/05/17/running-r-on-amazons-ec2/ which describes how to run R on Amazon EC2. 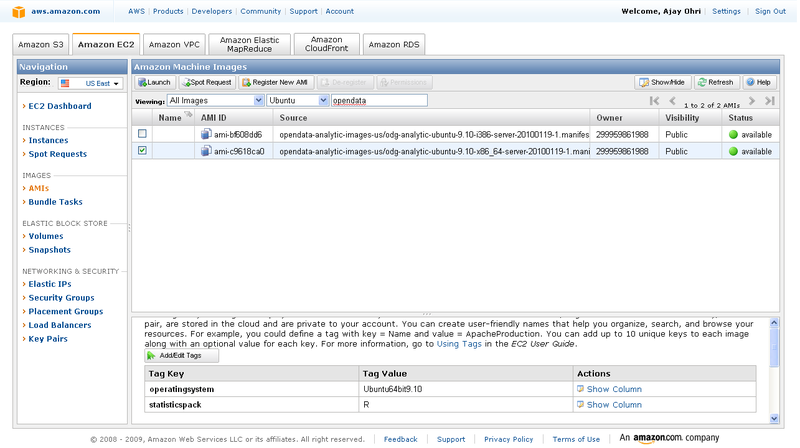 I tried it out and have subsequently added some screenshots to this tutorial so as to help you run R. My intention of course was to run a R GUI preferable Revolution Enterprise on the Amazon EC 2- and crunch uhm a lot of data. Note you need your Amazon Id (even the same id which you use for buying books). On the left margin, you can click AMI -Images. I chose Ubuntu images (linux images are cheaper) and opendata in the search as belows- I get two images. You can choose whether you want 32 bit or 64 bit image. Thumb rule- 64 bit images are preferable for data intensive tasks. 2) A pop up comes up, which shows the 5 step process to launch your computing. 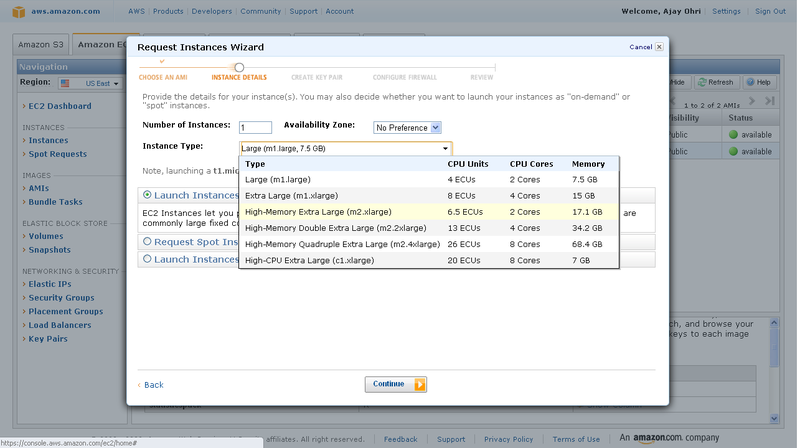 Choose the right compute instance- As the screenshot shows- there are various compute instances and they all are at different multiples of prices or compute units. 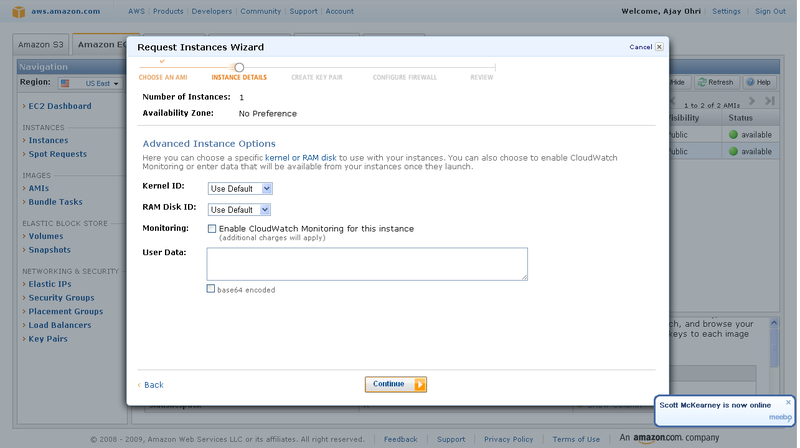 I did not choose cloudburst monitoring as it has a extra charge- and I am just trying out things.So I simply clicked continue. 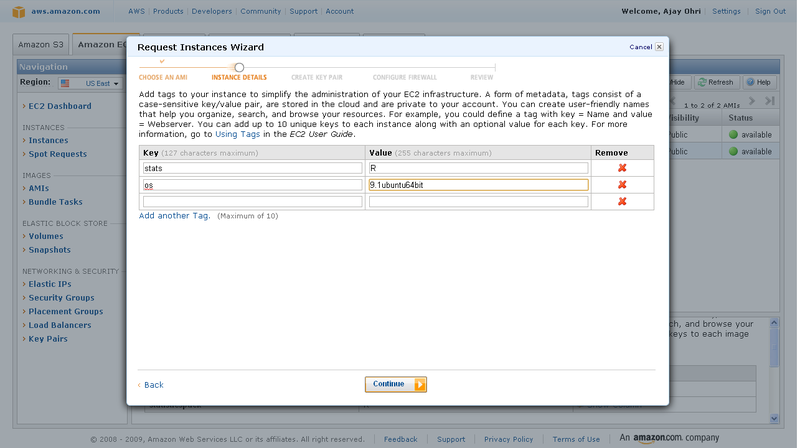 4) Add Tag Details- If you are running a lot of instances you need to create your own tags to help you manage them. Advisable if you are running many instances. Since I am going to run just one- I clicked continue with adding just two things OS and Stats Package. After clicking and downloading the key pair- you come into security groups. Security groups is just a set of instructions to help keep your data transfer secure. So I created a new security group. Open the SSH client of your choice (e.g., PuTTY, terminal). 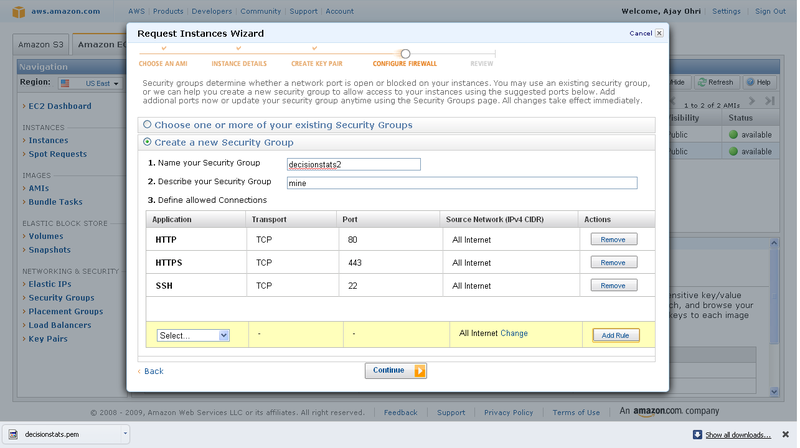 Connect to your instance using instance’s public DNS [ec2-75-101-182-203.compute-1.amazonaws.com]. If you are choosing Ubuntu Terminal to connect- you need to change the word root from above to Ubuntu above. 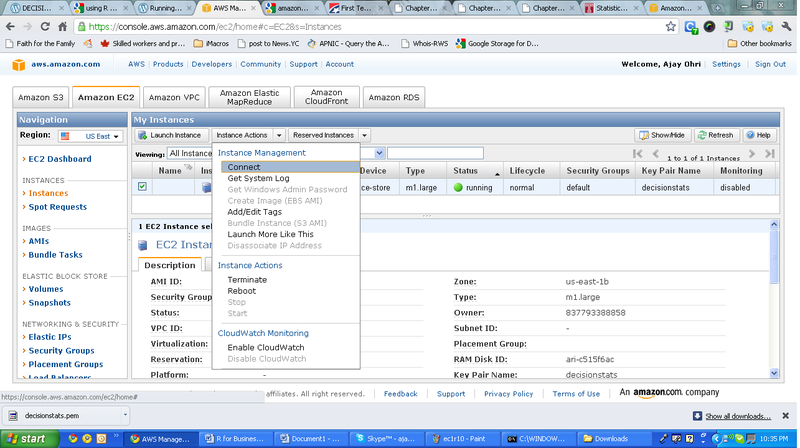 Go to LEFT Margin-Instances-Check the check box of instance you are running- on upper tab- Instance Actions- Click Terminate. Amazon EC2 Ubuntu 8.10 intrepid AMI built by Eric Hammond; Eduardo Leoni added R, many R packages, JAGS, mysql-client and subversion. Ashamed at my lack of parallel programming, I decided to learn some R Parallel Programming (after all parallel blogging is not really respect worthy in tech-geek-ninja circles). So I did the usual Google- CRAN- search like a dog thing only to find some obstacles. 2) Should R be written from scratch? This has been done with S, then S Plus and now R.
3) What should be the license of R (if it was made a new)? GPL license is fine. You need to do a better job of executing the license. 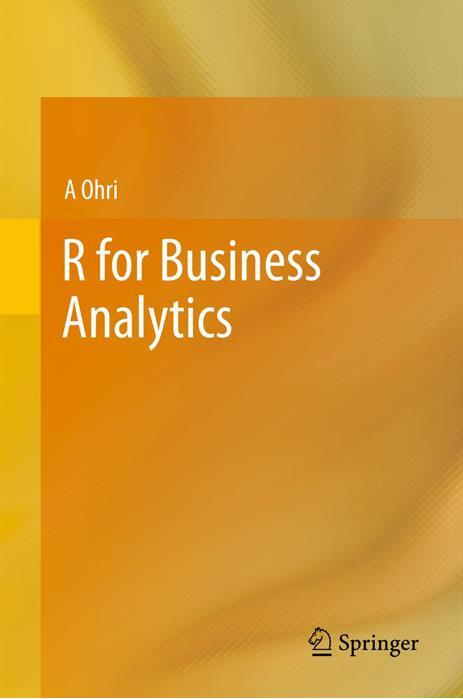 Currently interfaces to R exist from SPSS, SAS, KXEN , other companies as well. 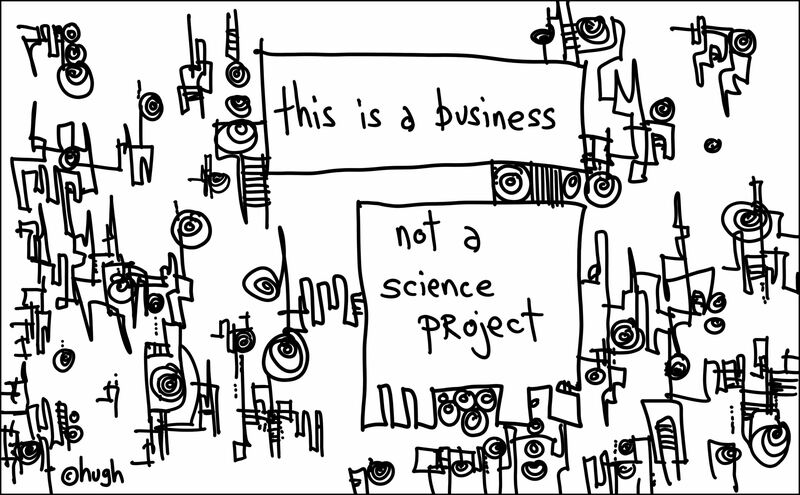 To my knowledge royalty payments as well as formal code sharing does not agree. Eg GGplot and Hmisc are likely to be used more by average corporate user. 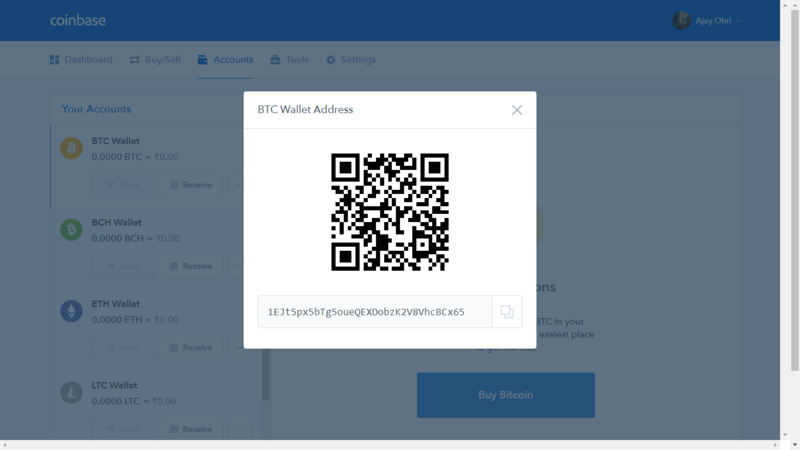 Do their creators deserve royalty if creators of RevoScalar are getting it? 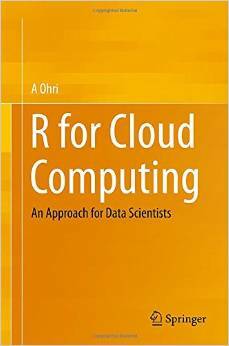 An interesting debate on whether R should be killed to make an upgrade to a more efficient language. in these (IMHO) important discussions.